In Home Viewings: "Take Shelter"
Curtis (Michael Shannon) is the prototypical working-class American male. He is a good husband to his wife, Samantha (Jessica Chastain), a caring father to his deaf daughter, Hannah (Tova Stewart), and a dependable employee. Curtis’ life starts to unravel, however, when he begins to have disturbing dreams. Nightmares which always revolve around a storm and always involve someone close to him trying to kill him plague his every sleep and soon Curtis becomes a paranoid, distracted man. As the dreams increase in frequency and intensity, Curtis becomes convinced that he is being given visions of the future. He puts aside all other responsibilities to build a shelter that will protect his family from their impending doom. But as he slips further and further from reality, it becomes more and more unclear as to whether these dreams are actually visions or the first signs of the mental illness that runs in his family. Take Shelter is a prime example of independent filmmaking at its finest. Writer/director Jeff Nichols has crafted a brilliant, completely organic thriller that creates more heart-pounding drama than I would have ever imagined. 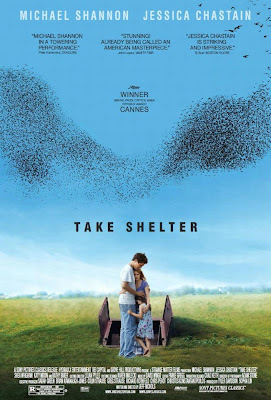 Nothing about Take Shelter is overstated or flashy; rather, it is a workmanlike film that starts with one dramatic crossbeam and builds upon itself in deliberate, well-paced fashion. No time is wasted, no side-plot is elaborated upon unnecessarily, and no scene fails to deliver. Nichols drops us into Curtis’ life, quickly gives us a glimpse into his situation, and then begins the process of creating a tense, riveting environment that continues to grow until the final credits roll. But with all due respect to Nichols (whom I suspect we’ll hear a great deal more from in the future), the immense value of Take Shelter comes as a result of the work of Michael Shannon. Though he is an outstanding actor, my complaint about Shannon has always been that he generally chooses difficult, inaccessible roles that are difficult to relate with. As a result, he often gives performances that are excellent but which fail to strike much of an emotional chord with me. Not so with Take Shelter. Beyond the sheer quality of his acting ability which is most certainly on full display here, Shannon empowers Curtis with an incredible believability. You’re never sure if Curtis is going crazy or not, just as Curtis himself isn’t sure, and that, for me at least, is what truly makes Take Shelter work. Above all else, Curtis wants to protect his family but at times, you’re not sure whether he means to protect them from the horrible future he sees in his visions or from himself. Shannon exemplifies this conundrum with as few words as possible, lending serious weight to an already dense role. This is unmistakably Shannon’s finest moment to date. It’s just a shame that his film happened to drop during a year that was dominated by outstanding male performances. His portrayal deserved FAR more attention than it received and it is this powerful work that makes Take Shelter a true achievement in filmmaking.